The Center for Health Market Innovations (CHMI) identifies, analyzes and connects programs working to improve health and financial protection for the poor. Health Market Innovations are programs and policies—implemented by governments, non-governmental organizations (NGOs), social entrepreneurs or private companies—that have the potential to improve the way health markets operate. These programs and policies harness or improve transactions that occur in the health care marketplace to promote better health and financial protection for the poor. 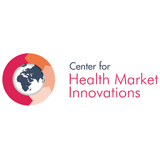 To bridge the existing information gaps about Health Market Innovations and help diffuse promising programs, the Center for Health Market Innovations engages in three core activities — Information, Analysis, and Linkages — linked and integrated through the CHMI web-platform. Map Global Innovations. Search in Programs to locate innovative health initiatives by Program Type, Health Focus, Target Population, or Legal Status. Use the “Embed” button to post a window into CHMI’s database on another website. Connect with Innovators. Join CHMI to directly contact people running programs listed in CHMI’s database. Engage in dialogue with the Health Market Innovations community on CHMI’s Blog. Contribute to this Resource. Donors and investors rely on CHMI’s database of programs—built through in-country mapping and crowd-sourcing from innovators—to identify candidates for funding. Know an innovative program? Promote it by adding a new program profile, updating an existing listing, or writing a guest blog for the CHMI Blog. CHMI works through a network of partner organizations in 16 countries where there are large numbers of private health care providers. CHMI is funded by the Bill & Melinda Gates Foundation and the Rockefeller Foundation.